Basic comprehension of sine law and cosine law is a prerequisite to solve these exercises that are categorized into different topics. 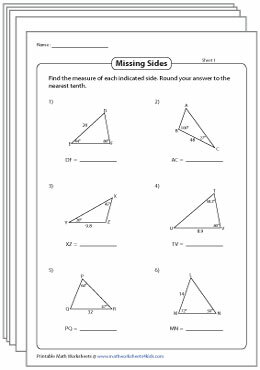 Solving triangles worksheets are packed with practice problems to assess student's understanding in the law of sines and the law of cosines. 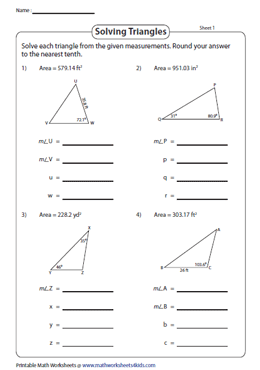 Navigate through our enormous supply of worksheets to find the missing side, determine the unknown angle, find the area of SAS triangle and many more by applying the law of sines. Law of cosines is an important formula, used in solving triangles (except right-angled triangles). 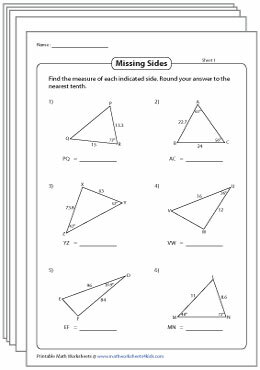 Download this wide array of the law of cosines worksheets to find the unknown angle or missing side of each triangle. 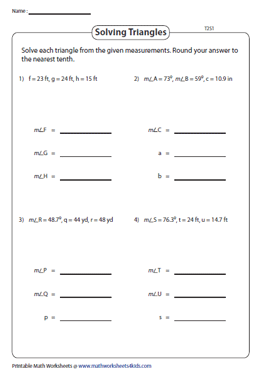 Review the law of sines and the law of cosines with this assortment of worksheets. 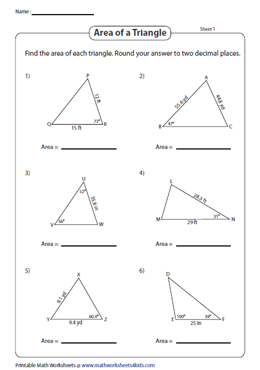 Help students understand how to use both the laws in solving triangles. Implement either the sine law or the cosine law to solve the triangles featured in type 2 worksheets. Test your comprehension of these laws by solving the triangles with the given set of measurements. Read the triangle and use the appropriate Sine or Cosine formula to figure out the measurements that are required to find the area. Then substitute your values in Area = 1/2 ab sin c to determine the area of the triangle. 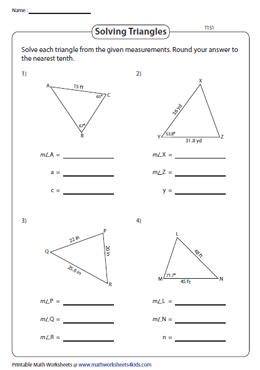 Gain proficiency in trigonometry with this batch of advanced worksheets. Solve each triangle by utilizing the formulas of sine law, cosine law and area of a triangle.